Join us on February 9th from 8:30 am – 2:00 pm for the Men’s Retreat. A hot lunch will be provided by the Pleasant Grove United Methodist Women. 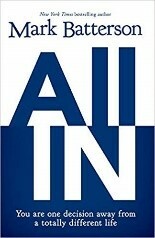 We will be taking a look at the book, “All In” by Mark Batterson.